Growing your own fruit trees can be very rewarding, but there may be questions and concerns on appropriate care along the way. This is a guide about caring for a pear tree. How can I bring an old pear tree back to good health. It produces a good crop, slightly discolored. Should I be spraying and fertilizing it? The best way to rejuvenate any type of old fruit trees is through pruning, increasing soil fertility and controlling diseases and insect damage. Pruning: First remove any broken and dead or diseased branches and then prune the tree to the proper shape and size. Remove any suckers and crossing branches to create an overall shape that radiates out from the center. This will allow plenty of sunlight and air circulation into the canopy. Pruning should be done in the late winter or early spring. Because no more of 25% to 30% of the total canopy should be removed in one season, if you haven't been pruning regularly, you may need to shape the tree over a period of 2 to 3 years before resuming a lighter annual pruning schedule. Soil Fertility: Aerating and amending the soil around your tree with organic nutrients is the best way to increase your soil's fertility. Spring is a good time to apply a high-nitrogen fertilizer as well as removing any competing grass and weeds from underneath the tree. Disease & Insects: Inspect your tree for insect and disease problems. There are several good books and Internet resources dedicated to the identification and control of fruit tree pests and diseases. Is it possible for me to re-pot my container pear tree now? It is 2 years old and fruits are just starting to form, small buds. Will it harm the plant if I re-pot it now or when is it the best time? Late fall or early winter is the best time to do this. However, if you can lift the plant out of it's container and keep all the soil intact and do not disturb the roots at all, you can do it at any time of the year and the plant won't know the difference. Do webs in pear trees indicate poor health of tree? How do I treat? The tree is at least 50 years old. You may have webworms, which are simply the larvae of a moth, spinning their own cocoon to protect themselves as they eat and grow. Eventually, they will all take flight and your tree will not be worse for the wear (relatively, they will eat a few leaves before they are done growing). However, if you absolutely must remove them, you can poke holes in the cocoons and wasps will appear out of nowhere to eat them all. You can also cut off the branches and remove far enough away from trees or plants you don't want infested. I planted an Acres Home pear tree. It has leafed out, but the top of the limbs are beginning to die. I had trimmed it back when I planted it. The rest of the tree looks to be healthy. You don't say where you are located. You may want to make sure that there are no gophers nibbling on the roots. This can definitely affect the health of the tree. I have pear trees that are about 7 years old and I cannot get them to grow. Every summer they grow about 3 feet tall and then in the spring the new growth is dead and I have to cut them back to around 6 inches again. Can someone tell me what I am doing wrong? They are trees that are zone 6 hardy. 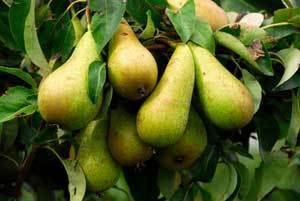 Pears are deciduous fruit trees that are the most tolerant of wet soil than all the other types of fruit trees. Pear trees thrive in well-drained soil though. 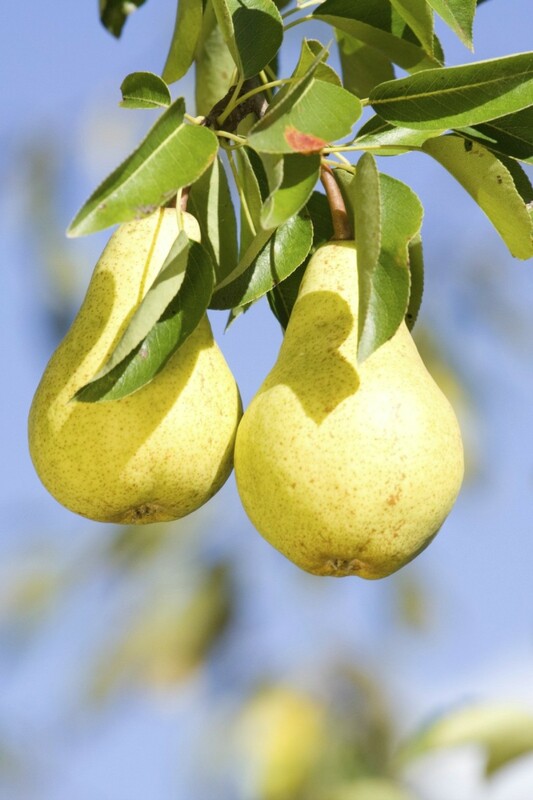 Most varieties of pear trees are self-sterile and require another variety of pear tree to cross-pollinate with in order to set a good fruit crop. Pear trees need maintenance to grow properly and fertilization for healthy growth. Step 1 Create a circle of balanced fertilizer like 13-13-13 around a newly planted tree when new growth begins. Spread 1/2 cup of fertilizer in a circle 6 inches from the trunk and end the circle 2 feet from the tree. Keeping the fertilizer away from the tree trunk prevents fertilizer burn. Step 2 Scratch the fertilizer into the soil to the depth of 1/2 inch with a hand cultivator. This prevents the fertilizer from washing or blowing away. Water thoroughly to start the fertilizer working its way down to the pear tree roots. Step 3 Fertilize young trees each month using only 1/4 cup of fertilizer throughout the summer growing season. Scratch into the soil and water like before. Step 4 Feed mature trees each spring using 1/2 cup of complete fertilizer for every year of age until the pear tree is 4 years old then keep the fertilizer at the rate of 2 cups. Step 5 Add the spring rate of fertilizer to the pear tree during the fall right after the fruit is harvested. Q: I have a pear tree that is several years old, we always have lots of pears but they crack and are very hard. We never have any to harvest. Can anyone help? Are your pears splitting and rotting right on the tree? Do the fruits or leaves have velvety olive-brown spots on them? If so, your tree could be suffering from a disease called pear scab. With scab, as the pears mature the spots turn into "corky" lesions and the fruit usually cracks (or is malformed) and drops off the tree prematurely. Scab is a fungus that over-winters in leaves and twigs that have fallen from the tree. In the spring, the spores are carried by the wind to the newly developing fruit causing an infection. Once this infection occurs, a new "summer" spore is formed, which can last throughout the season and keep the annual cycle going. To control scab, you'll need to clean up leaf debris each spring and fall, and get on a schedule for spraying an organic fungicide. Before doing anything, I would get an expert out for an onsite opinion to confirm your tree's problem. I shot this photo of a pear tree in the sky.